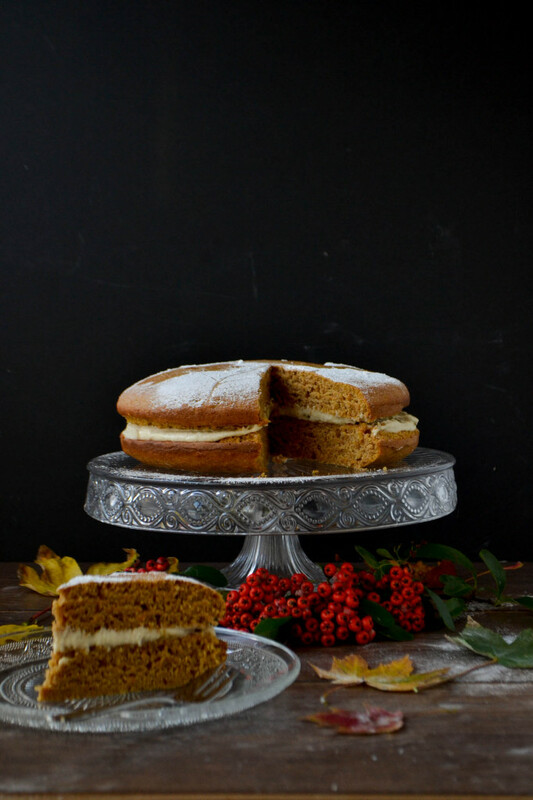 Butternut squash cake – because pumpkin is sooooo mainstream maaaaaan. 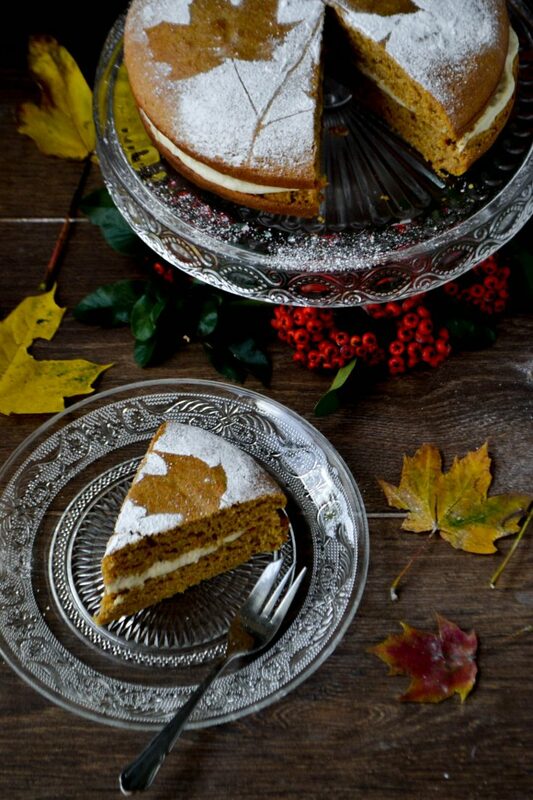 Of course, you could use pumpkin in this cake too if you wanted but I prefer butternut squash as it’s a little different and the flavour is so wonderful. Plus, I love to use the leftover squash for risottos and soups. I’ve used spelt flour which means it isn’t gluten-free but it is wheat-free and a much more wholesome and healthy flour than ordinary flour. 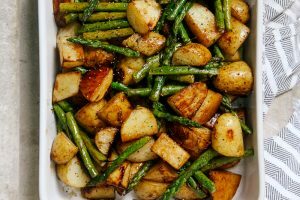 If you want to make this gluten-free, you can substitute the spelt for a gluten-free wholemeal plain flour mix. 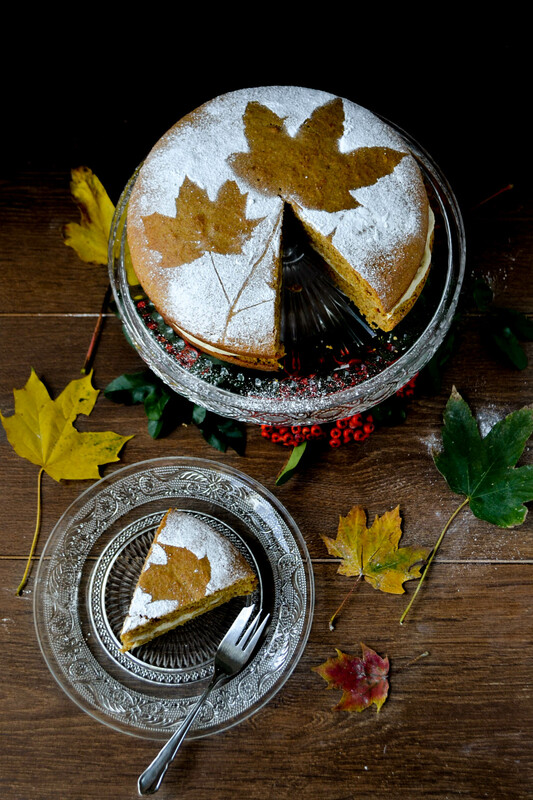 Perfect for autumn, this cake is a wholesome treat that's vegan-friendly and wheat-free. Preheat the oven to 180c. and grease two sandwich tins. 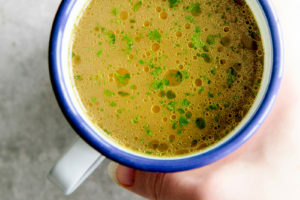 Add the cider vinegar to the almond milk and set aside. Sift the spelt flour into a mixing bowl and discard any large granules left in the sieve. Mix in the spices, salt, baking powder and bicarb. In a separate bowl, mix together the almond milk from earlier, squash purée, orange zest, vanilla, maple syrup and olive oil. Add the wet ingredients to the dry and mix until well combined and a smooth soup-y texture is formed. Meanwhile, make the almond cream "cheese" filling by mixing the ground almonds, almond milk, vanilla, coconut oil, lemon juice and maple syrup together in a blender until a thick, smooth icing has formed. Remove the cake layers from the freezer and coat one side with the marmalade and the other with the almond cream. Be as generous as you like! Sandwich together and serve. 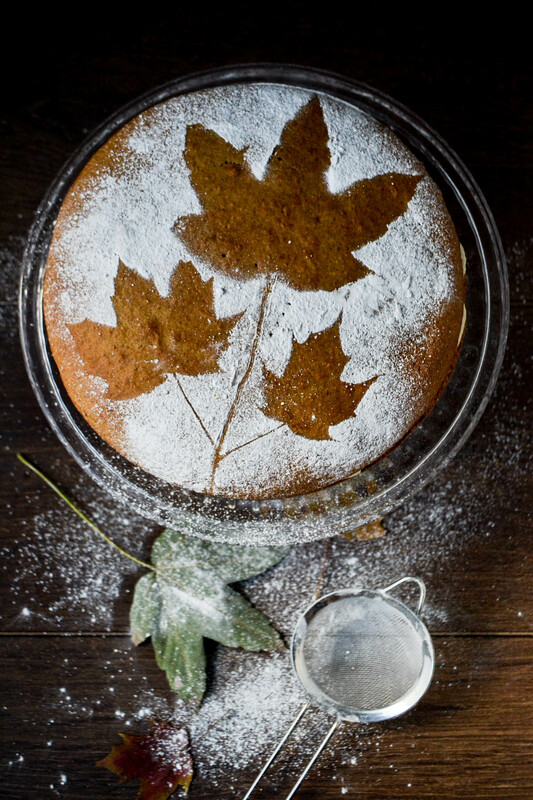 Optional: Arrange some (clean) leaves on top of the cake and dust with icing sugar for a stenciled leaf design! *To make butternut squash purée, simply peel and dice approx 1/3 of a butternut squash. Steam for 10-12 minutes until soft and then blitz in a blender until pureed. Quick question about the icing... you say too use a tbsp of coconut oil, but is that going in solid, or melted first? If its melted how do you stop it instantly solidifying the moment it hits the other ingredients, which are at room temperature? Lovely and very tasty desert. The only things I changed were the following: •	Substituded the pumpkin by dates •	Substituted the maple syrup by coconut syrup •	Added a bit of cardamom in powder Congratulations for the récipe! Suggestion to everybody: A Must Do It if you’re going to a dinner or tea party with diabetic people. I just wondered if you used whole spelt flour or white spelt? 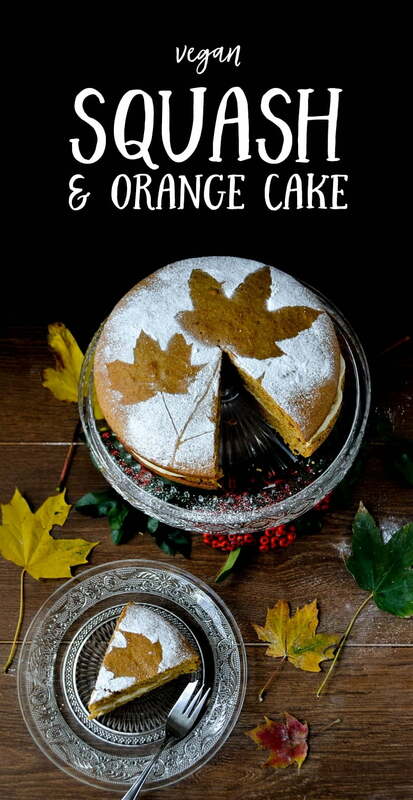 Also, do you think it would detract too much from the cake if you left out the orange marmalade? Thank you. This looks so good; I'm anxious to bake it. The best cake I have ever made! ''10/10 '' those are my mum's words when she tried it literally straight after she returned home from work tonight. The house was smelling great and that reminded me of those winter evenings spent watching Christmas movies. I'll have to remember to make it once again in the Christmas time. For now I am saving the recipe. So delicious! Your comment gave me a big smile, thanks Julia! 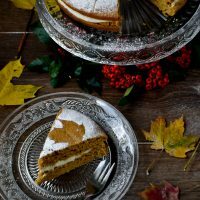 I especially love that it reminded you over those winter evenings, watching Christmas films because that's the exact kind of memory I think of when I eat this cake! So happy you enjoyed it. Hello! I baked this cake today (almond cream included, of course) and it was AH-mazing! The batter rose beautifully, the texture was prefect, and it tastes nice and light without the use of refined sugar. Plus it was so easy to whip up! All of the non-vegans in my household love it as well. Can't wait to make it again! Thanks for the recipe! Thank you so much Elisena! So happy to hear you enjoyed it :-) This was one of my favourite vegan cakes and now you're really making me want to bake it again soon! This is such a beautiful cake, Aimee! I love that you used butternut squash, love that idea! When I saw squashes at Trader Joes, I squeaked and went for delicata, butternut and kabocha squashes, haha. 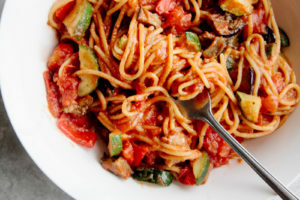 Thank you for the inspiration, sometimes savory dishes using squashes can get tiring, so now I have an idea to use them! Gosh, girl, this vegan cake looks beyond extraordinary, I love how you added butternut squash for color! Thank you for sharing such stunning photos! Oh wow, that cake looks incredible! Will be making this soon. 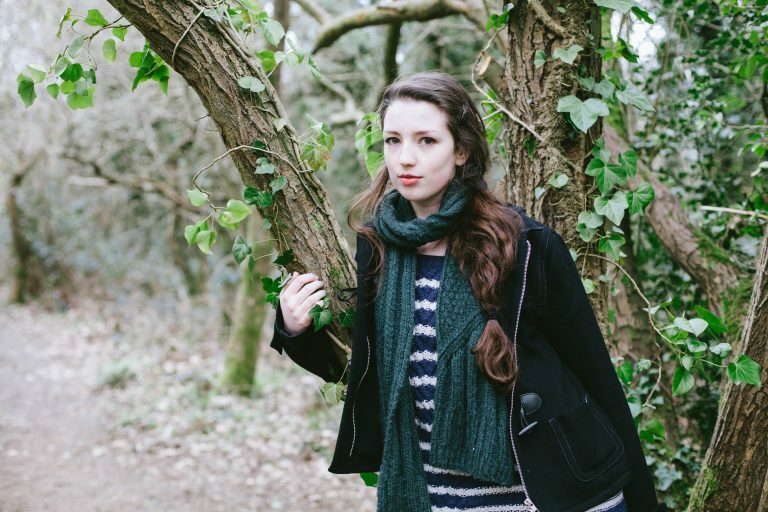 I have only just come across your blog and it is really stunning. 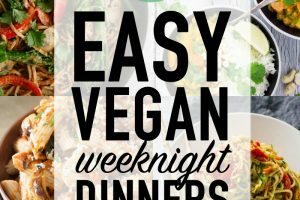 The photos are amazing and your recipes are right up my street! Also nice to have found another blogger from the UK too! Hi, Aimee! I just realised I've been missing a LOT of your amazing recipes. This cake is gorgeous! I just love the maple leaf on the top. 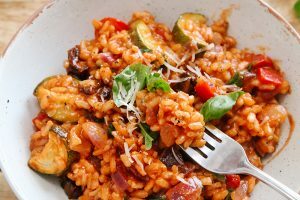 The filling sounds wonderful, too - I'd really love to try that as it comes so highly recommended! Love everything about this, love the flavours, love the top, love the plates, love the decor. Yep. This is awesome. What a beautiful Autumn sponge Aimee. Looks so moist and the filling sounds divine. Lovely decoration and pics too!